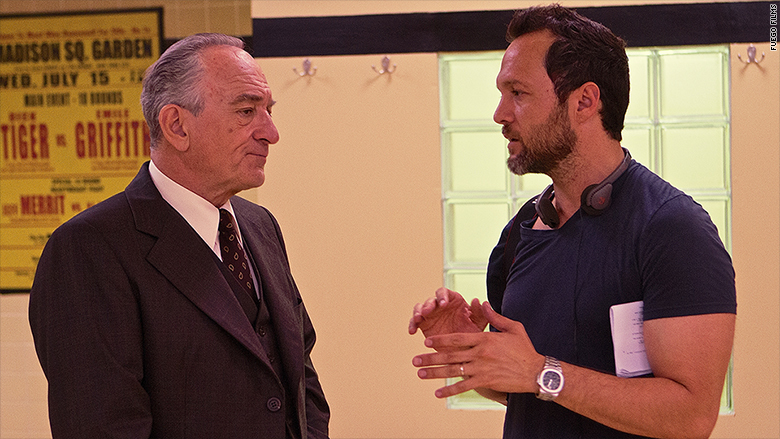 Robert De Niro and Jay Weisleder on the set of "Hands of Stone." 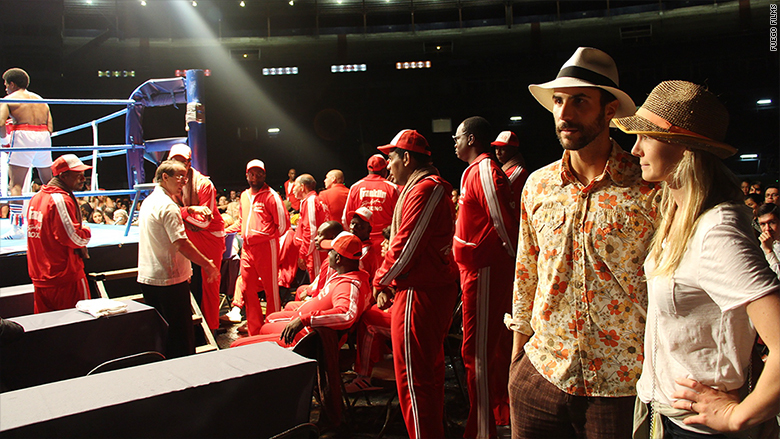 It took ten years and $20 million, but a budding Costa Rican filmmaker's dream of producing a big-budget biopic about legendary Panamanian boxer Roberto Durán has finally come to fruition. Starring Robert De Niro, Edgar Ramirez and pop singer Usher, "Hands of Stone" is the story of how Durán transcended a life of poverty to become one of the greatest pound-for-pound fighters of all time. The movie was produced by FuegoFilms -- a new production company formed by Jay Weisleder and Ben Silverman, the TV executive behind Latino crossover hits like "Ugly Betty" and "Jane the Virgin." Prior to this the duo worked together in TV development, where Silverman served as a mentor to Weisleder. To bring the film to the big screen, producer Jay Weisleder and Venezuelan writer/director Jonathan Jakubowicz told CNNMoney they had to fight to be taken seriously. "I think being taken seriously was harder because I wanted to make a big movie, but I had never made a big movie," Weisleder said. "Sometimes it's crazy to think that big, and sometimes it pays." They also had to fight against the perception that films with Latino themes don't sell. "The reality is that studios are afraid of making diverse films and that if there aren't big stars they won't do great," he said. The track record for this genre of film has been inconsistent. "Selena," about the revered tejano music superstar, was a huge hit. It grossed $11 million on its opening weekend in March of 1997, according to sales tracker Box Office Mojo. "La Bamba," the 1987 film about Mexican-American farm worker turned rocker Richie Valens, also performed well. But other films haven't proven as successful. "Spare Parts," a true story about a Texas engineering class of poor Hispanic students that beat MIT students in a robotics competition, produced by George Lopez, earned just over $1 million on its opening weekend in January of last year, Box Office Mojo reported. "Cesar Chavez," the story of the iconic Mexican-American labor rights leader, starring Michael Peña, America Ferrera and Rosario Dawson earned just under $3 million on its opening weekend in 2014. Big studios were insecure about selling to Latino audiences when he was pitching his idea, Weisleder said. "I don't think [the studios] felt comfortable that they knew how to market the film correctly. I wouldn't blame them, they weren't swimming those waters yet," he added. Several studio deals they came close to closing fizzled. But instead of giving up, Weisleder saw it as an opportunity. "The moment that the deals fell apart and we got the rights back [to the script] was the moment that we took control of the film," Weisleder said. He and Jakubowicz felt passionately that the U.S. needed to have more diversity in film -- and more positive representations of Latinos -- so they got creative about how to get the film financed. They'd heard that the Panamanian government had set up a grant for local filmmakers to produce films. Even though they weren't Panamanian, they were planning to produce a film honoring that nation's hero, so they went to Panama to pitch their film. He explained to the Panamanians that he wanted to do something big, with a big budget and big stars. Roberto Durán went to all the meetings, too, and Robert De Niro who was interested in the project sent a personal letter to the president of Panama. "You can look at it in the future and say you wish you could have been part of it or you could get in on this now," Weisleder recounts about his pitch. Panamanian officials agreed and invested almost their entire film commission budget in the hopes that it would ignite film production in the country. The film was shot in 10 weeks in Panama and one week in New York. The Weinstein Company will distribute it nationwide August 26th. "I hope that the film is successful because I think it will create precedent to make films with Latino heroes as the lede," Weisleder said.